Liberty will upgrade to FBS starting in the 2018 season. While FCS members upgrading to FBS has become almost routine, the LU case is quite unusual. Liberty has long been one of the strongest expansion candidates for G5 conferences looking to add an FCS member. 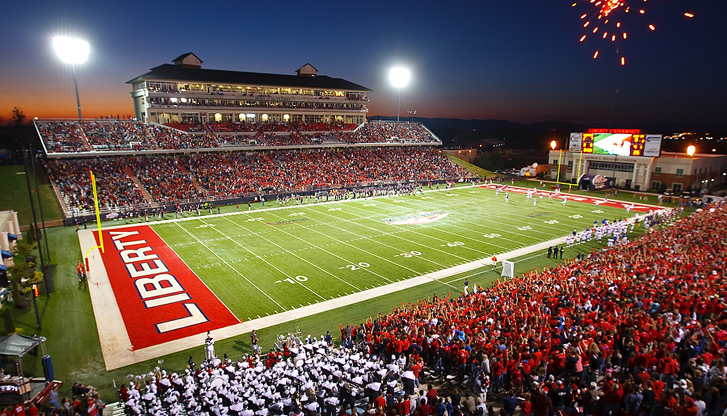 Liberty was the first FCS institution to offer cost of attendance for student athletes and also has its own sports network. However despite these impressive accomplishments and Liberty’s strong resume the institution watched time and time again as G5 conferences focused on FCS candidates that were perceived to be weaker. The reason Liberty was passed over is because it is a religiously affiliated school that is well known for its ultra conservative policies. These policies go far beyond the policies of any existing FBS school (even BYU) and that makes conferences reluctant to extend an invite to Liberty. Current FBS members do not want to deal with the intense criticism that would come with extending LU an invite. Nor do they want to acknowledge Liberty as a peer. Being invited to join an FBS conference (a bona fide invite) is a requirement for FCS institutions looking to move up. This has effectively placed a de facto embargo against Liberty for FBS membership. The NCAA gave Liberty a waiver to the bona fide invite rule allowing LU to finally upgrade to FBS. One question that has been asked is how are FBS schools going to respond to Liberty being a member of their division? Will Liberty struggle to find schools willing to schedule them? The answer is surprisingly no. The stigma affecting schools like Liberty in regards to conference realignment doesn’t usually translate to out of conference (OOC) scheduling. This is because athletic directors and coaches are the administrators who deal with scheduling matters whereas Board of Trustees and the Chancellor/President decide realignment matters. To best demonstrate this look no further than BYU and the Pac-12. The Pac-12 is home to some of the most liberal FBS institutions whereas BYU is widely considered to be the most conservative FBS institution. This has been a key reason why BYU has never been considered for Pac-12 membership. Despite that Pac-12 institutions have been willing to play BYU. 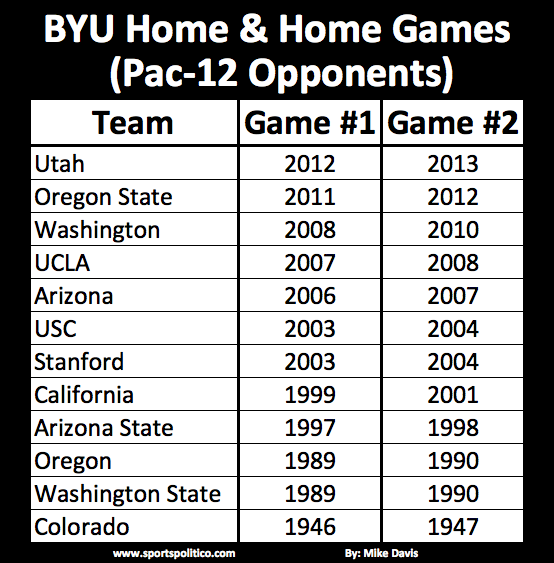 During the BCS/CFP era all but three Pac-12 schools scheduled a home and home (H&H) with BYU. Oregon and Washington State last had an H&H in 1989/1990. Colorado is the only Pac-12 school that hasn’t played BYU in the last 30 years. However their belonging to the eastern Big Eight/Big 12 conferences and not joining the Pac-12 until 2011 explains their omission. When you include all non-bowl matchups Oregon and Colorado become the only two schools to not play BYU during the BCS/CFP. Of the ten remaining Pac-12 schools seven of them have played BYU in the last six years. But these matchups were played while BYU was a member of the WAC and MWC conferences. That meant a limited number of OOC slates. In 2011 BYU left the MWC to become an independent drastically increasing the number of OOC slots they had available. It took BYU five years to stabilize from the scheduling chaos of such a move. But once they stabilized BYU had absolutely no shortage of Pac-12 opponents. 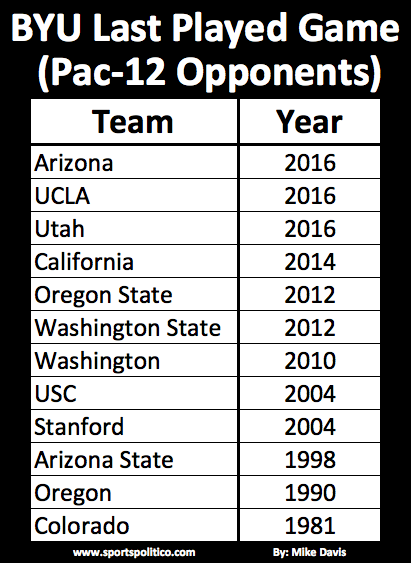 Barring any changes to current scheduling agreements the eight year period from 2016 to 2023 BYU will play 24 Pac-12 opponents for an average of three a year. This slate of Pac-12 teams is incredibly diverse with every Pac-12 team except Oregon State and Colorado playing BYU. So if BYU can do business with the Pac-12 then Liberty should have no problem finding FBS programs willing to play them. We already have evidence to suggest this. In the nine year period from 2011 to 2019 Liberty has played or is scheduled to play eight P5 opponents. Liberty had no problem finding FBS opponents while an FCS member so that trend should continue after LU becomes an FBS member. One last scheduling benefit Liberty has is their location in Virginia. The P5 schools in Virginia and North Carolina have an extensive history of being very friendly to smaller regional schools. It is a trend that isn’t really seen elsewhere in the P5. The Virginia and North Carolina schools have built a reputation for themselves with their willingness to prop each other up. Of the eight P5 matchups LU has already been given, six of them are from an NC or VA school proving that Liberty’s location will be a key asset. The other big question about Liberty joining FBS is whether this means the NCAA will open up the floodgates and allow any FCS school who can’t get an FBS invite a waiver. This is unlikely to happen as the NCAA has traditionally taken a strong stance against waivers before. If the NCAA had any intention of being passive towards this requirement they would have allowed the CAA to upgrade to FBS during the 2010-2013 conference realignment. One theory that has been proposed is this decision is related to the election of Donald Trump and/or Trump appointing key LU administrator Jerry Falwell Jr. to chair a taskforce on education reforms in January of 2017. Falwell Jr. publically commented on LU joining FBS “in a matter of months” back in September of 2016. (1) Meanwhile another report by CBS Sports references an anonymous source claiming the FBS process was 90 percent complete by the time LU hired former Baylor Athletic director Ian McCaw in late November. (2) So this specific move was a lengthy process that took months to plan and doesn’t fit a political timeline. This was purely an NCAA decision made for NCAA reasons. Fans love to paint the NCAA as an incompetent organization that often tries to make the most bonehead rulings possible. In reality the NCAA spends most of its time trying to do the right thing. The NCAA understood that this FBS invite rule is not discriminatory to other universities, but in the case of Liberty it absolutely was discriminatory. A more cynical view is Liberty had a very strong argument for an anti-trust lawsuit while the NCAA knew they were holding a losing hand and decided to fold. The bona-fide invite rule is only a decade old, it has never been tested in court, and the massive political/legal resources at LU’s disposal made this a very hard battle for the NCAA to win. Whether the NCAA was acting out of the goodness of their hearts towards Liberty or a fear of a lawsuit is something we will never know. It could be one or the other, or a combination of both. While an argument can be made that this may set a precedent for more FBS upgrades, Liberty is such a unique case that it is hard for other schools to argue they are a similar case. The only FBS candidate the Liberty wavier will have an impact on is James Madison University (JMU). 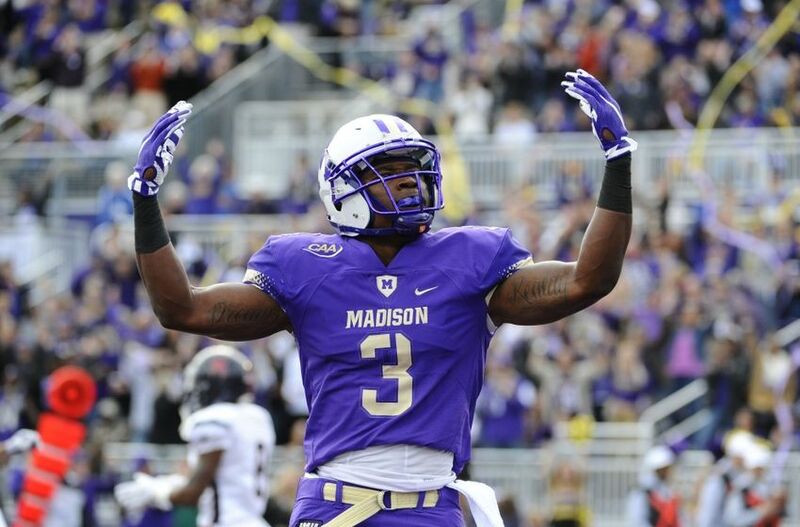 Like Liberty, JMU is often described as an FCS school with FBS level resources. While other FBS candidates have traditionally jumped at the first invite, JMU seems to have taken the path of only upgrading to FBS on their own terms. So JMU could argue they deserve a waiver as well. However the NCAA could just as easily say JMU gambled trying to wait for a better offer and they have only themselves to blame. While JMU has been dormant since the last round of realignment, the actions of LU will have a major impact on their thought process. The state of Virginia only has two FBS schools, both of which are P5 members. That essentially meant that as the best positioned FCS school, JMU was the number three school in the Virginia football hierarchy. However that changed when fellow Virginia school Old Dominion upgraded to FBS a couple of years ago and now the same can be said for LU. This has essentially dropped JMU down two spots to fifth, which would put pressure on them to more aggressively pursue an FBS invite. So the Liberty waiver will have only a minimal impact on FBS/FCS as a whole. It will have an impact on the thought process of JMU but it won’t open the floodgates for a wave of new FBS upgrades. While there is a chance JMU can use it as a precedent that has a very slim possibility of happening. Liberty joining the FBS level is a historic milestone for the untraditional way the Flames joined, but also being the first private institution to do it. Despite the nearly 40 year history of FBS and over two dozen schools upgrading in the past, no private institution has ever upgraded to this level, until now. Old Dominion is also FBS school in VA. it’s Three total. Down the road ODU and Liberty might be facing off on rivalry weekend. Until last year, Coastal was the big rival. but after Liberty joins FBS, then ODU might be the rival.